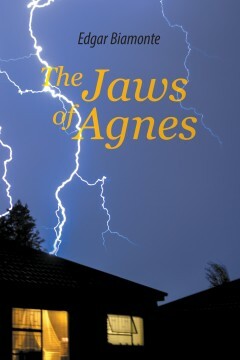 The Jaws of Agnes is a historical novel, documentary, and satire about hurricane Agnes. It describes the hurricane that flooded Elmira, New York, and adjacent towns in mid-June, 1972. Edgar L. Biamonte is an accomplished musician, educator and writer. As a pianist, he has been professionally performing in restaurants and various occasions since he was 18 years old. He joined the 686th Air Force Band as a beginning pianist in 1950. After being honorably discharged, he and his band toured Europe with Frank Sinatra, Tony Curtis, Janet Leigh, Rhonda Fleming and Ava Gardner during the Christmas season of 1952. He received his B.A. in English from Queens College, Flushing, New York in 1961 and his M.S. in Education from Elmira College Graduate School, Elmira, New York in 1968. He taught English, including poetry and creative writing at Southside High School in Elmira from 1962 until he retired in 1985. Over 100 of his 325 poems were published in literary magazines and many won or placed in various contests. Among his works are Window of Eternity, a life/death book published by Ashley Books in 1984 and Window to Eternity, a sequel published by Balboa Press in May 2012. He also wrote four novels and a collection of short stories. He eventually became an accomplished jazz pianist and composer and soloed on several Carnival Cruise ships and “Mariner of the Seas,” Royal Caribbean Line. He still plays piano professionally and appears on the Internet under edgarbiamonte.com. Currently, he is a resident of Hemlock Farms since he moved from Miami in 2002. He has three sons, one daughter, two grandchildren and five great-grandchildren.